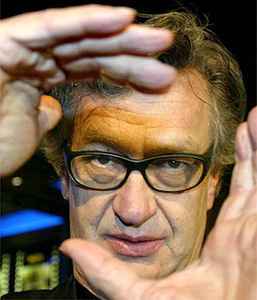 German artist, cinematographer, film critic, author, born in Düsseldorf, 14 August 1945. Married to Donata Wenders. Has collaborated with, among others, the authors, actors and directors Sam Shepard (2), Francis Ford Coppola, Peter Handke and Jessica Lange as well as with renowned musicians such as U2, Nick Cave, Lou Reed and Blixa Bargeld. Became member of the Akademie der Künste in Berlin in 1984, received an honorary doctor title from the Sorbonne University in Paris in 1989, teached between 1993 and 1999 at the Munich Hochschule für Fernsehen and Film (HFF) and was from 1991 to 1996 the appointed Chairman of the European Film Academy and was subsequently elected as the Academy’s President. Winner of the prize for Best Director at the 1987 Cannes Film Festival (for Der Himmel über Berlin) and the Friedrich Wilhelm Murnau Award in 1991.